The Rolling Stones American Tour in 1981 was the most successful tour of that year, taking in a then-record $50 million dollars in ticket sales. The tour was in support of the critically and commercially successful 'Tattoo You' album. There were fifty dates on the tour which ran from Philadelphia at the end of September through to Hampton, Virginia on the 18th and 19th of December. The show on December 18th, which was also Keith Richards birthday, was the first ever music concert to be broadcast on television as a pay-per-view event. The footage has now been carefully restored and the sound has been newly mixed by Bob Clearmountain for this first official release of the show. Back in 1981, I was a newly-minted Rolling Stones fan, and I desperately wanted to see them live on their fall US tour. Alas, this wasn’t to be. I couldn’t land tickets for any of their three local shows that December, and though I could’ve gone to a concert in another part of Virginia, my dad wasn’t eager to let my 14-year-old self go so far for an event. Eventually I made up for this, as I saw the Stones three times in 1989 - and an additional 50 concerts over the subsequent 25 years. Even with all those shows, though, I wish I’d gone to see them in 1981, as I know I would’ve loved it. As much as I’ve enjoyed the Stones since 1981, that year represented the peak of my fervor for the band, so it would’ve been great to check them out at that time. With a new Blu-ray called Hampton Coliseum Live in 1981, I can check out what I missed in person back then – literally, as it represents the show I would’ve seen if my dad had let me venture out of town. Shot for a December 1981 pay-per-view event, the concert spans the band’s career to that time across its 25 songs. The then-current Tattoo You accounts for six of the show’s tracks: “Neighbours”, “Black Limousine”, “Hang Fire”, “Waiting on a Friend”, “Little T&A” and “Start Me Up”. Its predecessor – 1980’s Emotional Rescue - contributes another two numbers for “She’s So Cold” and “Let Me Go”, while 1978’s Some Girls brings us “When the Whip Comes Down”, “Shattered”, “Just My Imagination”, “Beast of Burden” and “Miss You”. The Stones completely skip the run from 1973’s Goat’s Head Soup, 1974’s It’s Only Rock ‘n Roll and 1976’s Black and Blue. From 1972’s Exile on Main Street, we find “Tumbling Dice”, and 1971’s Sticky Fingers delivers “Brown Sugar”. Heading back to the Sixties, 1969’s Let It Bleed presents its title song and “You Can’t Always Get What You Want”. 1969 also boasts the single “Honky Tonk Women”, and 1968 gets represented by another 45: “Jumpin’ Jack Flash”. 1967’s “Let’s Spend the Night Together” was also a single, though it appeared on the US version of Between the Buttons as well. Looking back at the 1981 tour, it now can be viewed as the last time the Stones would tour as a true current hit-making band. After this outing, they’d stay off the road until 1989, and while they experienced success with that year’s Steel Wheels and subsequent albums, they’d essentially become an “oldies band” at that point. Including Steel Wheels, the Stones have put out only four studio albums across the second half of their 50-plus-year existence, and while I think they’ve done good work on those recordings, people don’t attend their concerts in the hope that they’ll play multiple songs from those releases. Indeed, two of the last three Stones treks have been literal “greatest hits” affairs, as both the 2002-03 Licks and 2012-14 “50 and Counting” tours supported compilations. Both of those packages – 2002’s 40 Licks and 2012’s Grrr! - included a handful of new songs, but they remained hits packages at their core. Only the 2005-07 Biggest Bang Tour - connected to a new, full-length studio album, and even then, the setlist regularly concentrated on songs recorded during the band’s first 20 years. With all that as a background, it seems nearly shocking to see how more than half of Hampton comes from songs that appeared on the Stones’ three most recent albums at the time. That would never happen again, and it gives the show a distinctive feel unfamiliar to those of us who didn’t see the band until 1989 or later. Not that this makes the 1989-2014 shows bad, of course. I’ve seen some genuinely great Stones concerts over the last 25 years, so I definitely don’t want to come across as negative about their live performances since 1989. That said, I do find myself wistful for the period in which the Stones remained a major act in all ways. Sure, they can still sell concert tickets with the best of them, but as noted, they don’t maintain cultural relevance in the same way they did in 1981, back when a new Stones album was an event. For years, those of us unable to see the 1981 tour in person have had to content ourselves with two documents: the 1983 concert film Let’s Spend the Night Together and the 1982 live album Still Life. Neither offered a particularly satisfying glimpse of the Stones circa 1981. I don’t think either of them seemed bad, but both came across as stiff and somewhat perfunctory – which may have been a good thing, as that interpretation allowed me to feel less bad that I didn’t see the Stones in 1981. I told myself it wasn’t a big deal that I didn’t go because they weren’t very good on that tour. Hampton does a lot to contradict that long-held belief, as it shows the Stones in fine form. Some of the same problems that mar Night and Life appear, mainly due to Mick Jagger’s erratic vocals. By 1981, Jagger tended to bark/yell more than sing a lot of the time, and that decision became one of the reasons Night and Life faltered. Jagger still leans in this direction at times during Hampton, but he also manages to actually sing more than I expected. This leaves his vocals as firmly middle of the pack for him. I’ve heard him sound better but also have heard him much worse, so in the end, I find his Hampton singing to be perfectly acceptable. Based on other live documents, I also had the sense that the band was generally sloppy during the 1981 tour – sloppy even by the Stones’ standards. No one who understands the Stones expects them to play a tight Eagles-style note-perfect show – and honestly, I don’t think Stones fans want them to put on that kind of performance. Much of the band’s charm comes from their loose, raggedy nature live, as their tendency to often seem close to coming off the rails adds energy to the concerts. That said, my prior experiences with the Stones live circa 1981 led me to believe they were simply “off” on that tour, as the music didn’t gel as it should. Happily, they come together really well in Hampton. Mistakes occur, of course, but the band seems well-connected. The concert took place at the end of a three-month tour, so some fatigue appears evident, but the chemistry that comes from playing consistently for so long dominates and allows the Stones to sound awfully good much of the time. As for the visual presentation, it tends to be meat and potatoes, which is what one would expect from a program shot for a live pay-per-view. The video documents the show in an efficient way, without bells or whistles. Yeah, it could’ve been more dynamic but I’ll take straightforward over gimmicky any day of the week. The show manages to present one of the band’s most famous on-stage moments as well. During the finale of “Satisfaction”, some dimwit runs on stage. Keith Richards sees the guy, whips off his guitar and whacks the dope in the head with it. Awesome stuff – and it reinforces how cool Keith could be. I’ve gotten a little tired of Keith’s shtick in recent years, as it feels like he buys his own hype too much of the time, but in his prime, he really did exude a particular dangerous cool that made him unique. It’s hard to imagine many other rockers who could handle a stage intrusion with such calm – and hop right back to the song. All in all, I feel satisfied with Hampton. While it doesn’t represent the Stones at their absolute peak, they still sound very good, and the setlist gives us a unique glimpse at the band’s work circa the late 70s/early 80s. The concert satisfies. 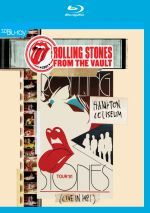 Rolling Stones: Hampton Coliseum Live in 1981 appears in an aspect ratio of approximately 1.33:1 on this Blu-ray Disc. An erratic picture, much of disc looked pretty good, but a mix of concerns left it with an average grade. Sharpness varied. Close-ups seemed fairly detailed and concise, but shots that went farther out than that started to encounter problems. Definition faltered to different degrees with those images, largely because the presence of jagged edges made them look rough. The farther the camera pushed out, the more prominent these became, and they could offer some distractions. A little shimmering popped up as well, though I noticed no signs of edge enhancement. Some rolling video bars could pop up but otherwise the source appeared to lack obvious flaws. Via clothes and lighting, Hampton presented a pretty broad and lively palette, but the disc only managed to achieve moderate success in regard to the replication of these tones. At times, the various colors looked nicely bright and vivid, but they also could come across as somewhat muddy and messy. As with sharpness, closer-up shots offered the best hues; the farther out the camera went, the more likely it became that the messiness overwhelmed the colors. Blacks were fairly deep and firm, but low-light shots tended to seem a little too dense. Shadow detail appeared acceptable but no better. Ultimately, Hampton was a decent but unexceptional picture that merited a “C”. Note that during “Beast of Burden”, the visuals suffered from a distinct drop in quality. While the image seemed mediocre the rest of the time, it became truly ugly around the 1:05:00 mark and stayed the way through the end of “Burden”. I have to guess that there was a problem with the source and the disc’s producers had to resort to a lower-quality copy for those moments. Once “Burden” concludes, the visuals go back to their prior level of quality. I felt pleased with the solid DTS-HD MA 5.1 soundtrack of Hampton. As one expects from a concert presentation, the soundfield remained focused on the front, where they showed strong stereo imaging. Mick’s vocals appeared firmly set in the middle. Audio quality was generally pleasing. Other than a little edginess at times, Mick’s vocals worked fine, as they replicated the desired impressions well. The rest of the track also showed good clarity and a dynamic tone. The instruments remained crisp and vivid during the concert. At times I thought bass response could’ve been a little deeper, as the track was marginally thin during some tracks. This wasn’t a true issue – more of a preference – so it didn’t detract terribly from the presentation. Taken as a whole, the audio worked fine. The disc itself includes no extras, but we do get a booklet. It offers a good essay from Richard Havers as well as photos and art from the tour. It acts as a nice complement to the set. With Hampton Coliseum Live in 1981, we find a good representation of the Rolling Stones at the end of their “classic period”. The show exceeds expectations to become a lively, enjoyable take on the band circa the Tattoo You era. The Blu-ray presents erratic visuals as well as good audio and an informative booklet. As a longtime Stones fan, I’m delighted to have this nice document of the 1981 tour.